1. Heat the oven to 250 / 130 / gas 1. 2. Grease a 8″x 8″x 2″ metal baking pan with a nub of the butter. 3. In a large pan stir the remaining butter, sugar, and syrup on a stovetop over a low heat. 4. Add the oats and salt. Stir well. 5. Press the mixture evenly into a greased baking pan. (the middle will seem uncooked). 7. Remove from the oven. Cut into 12 pieces. Leave inside the pan until cold. Do not overcook! The best flapjack is moist, buttery, and chewy. 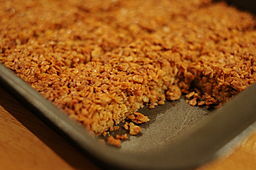 This entry was posted in Recipes and tagged Olde English Flapjack. Bookmark the permalink.